I have been thinking about this book for twenty years but the challenge of decision-making has recently been a daily illustration by my children who are beginning college. Like any parent, I worry about their decisions. I made up my mind to finish this book to make a difference in their young lives. As I began writing, I realized this book can do much more for a great many people. Every five years, my high school class reunion has stimulated for me great questions about how our lives develop. I noticed how my classmates’ lives (and mine) were diverging in different directions and success was taking shape at different times and different levels for each of us. My college peers added to this data as we reconnected, having many chats over many beers. My research revealed why success is no accident. Over time, I pieced together the factors that seemed to determine whether (or not) we get what we want in life—as a person. The question has fascinated me because society gets distracted by the headlines of the atypical/uncommon celebrity or entrepreneur, and it doesn’t learn the underlying success formula for the masses. I scraped away the luck and factors we cannot affect, and I found out that successful people approach decisions with caution and make decisions via evaluation with a clear mind. It is more process and less randomness. It is more about taking control and less about being a victim. I found few exceptions to this good process when luck is not involved. So, I set out to describe in my book, The Decision Makeover, a new language of decision making and an approach to decision making that will work today and in one hundred years. I wanted to write this book because people like me and you are striving to achieve more with our lives while being happier doing it, and sometimes we are just one good tool away from making a big difference. The word “makeover” is very important because it is positive and hopeful. I believe we can begin making better decisions at any stage of our life. 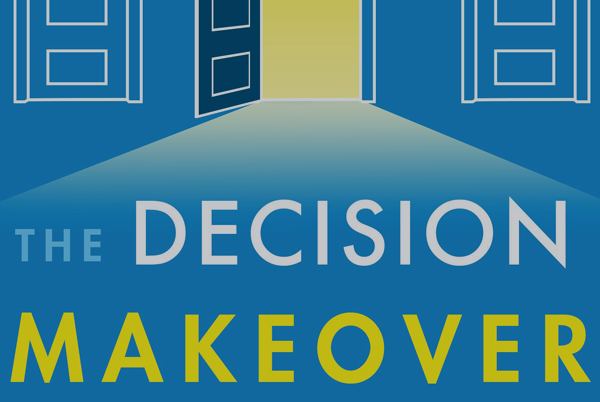 The strategies and tools in the book are built to achieve a makeover via decision making. We only need to take the next step.